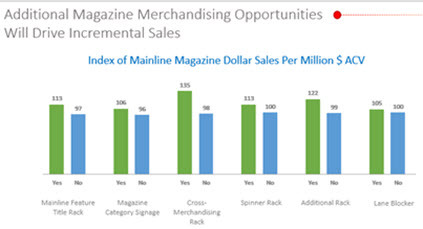 A new, in-depth study confirms that grocery retailers that employ specific magazine mainline best practices yield significantly higher sales than their counterparts. “High-performing stores realize 53% higher magazine mainline sales than the average-performing stores,” reported Bill Dusek, managing director of Dechert-Hampe & Co., during the 2017 Magazines & Books at Retail (MBR) Conference. 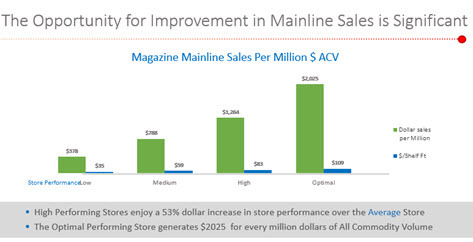 Specifically, high-performing stores generate nearly $1,264 from the mainline for every $1 million of all-commodity volume/ACV, versus $788 for the average-performing mainline store. And the best performing stores generate $2,025 from the section. “This means that there’s huge opportunity for average- and lower-performing stores to leverage mainline merchandising best practices to significantly improve sales,” Dusek stressed. Time Inc. Retail and MBR sponsored the study, which included store audits of the mainline magazine sections in 500 supermarkets across 13 retailers (Kroger, Safeway, Publix and Ahold, among others); consumer interviews; sales data on all mainline titles; and an evaluation of mainline merchandising practices. The audits were conducted by Magnet and TNG, the store ACV was provided by Time Inc. Retail, and the consumer interviews and overall analysis were conducted by Dechert-Hampe. Online interviews about magazine buying habits with 2,200 people were followed by in-depth interviews with 300 consumers who reported having purchased at least one magazine from the mainline section of a supermarket within the past three months. The research yielded insights about the demographics of consumers who buy at mainline, and how consumers interact with the section, as well as about merchandising dynamics. Dusek’s full PowerPoint presentation is available in the 2017 Conference area of MBR’s site. Here, we offer some highlights of his summary of the findings. *Section is 25 linear feet or more, with a sales-per-million dollars of ACV index of 131. Sales in stores with more than 25 feet of mainline space were 31% higher than the average store. The second-best performers had 20 to 24 linear feet, with an index of 118. *Section is located toward the middle or center of the store—ideally with end-of-aisle exposure. * Best-in-class across-the-aisle adjacencies include greeting cards, pet care, HBC, paper products, school/office supplies, seasonal products, and end-of-aisle. *The display supports many titles, and provides for varying consumer interests. 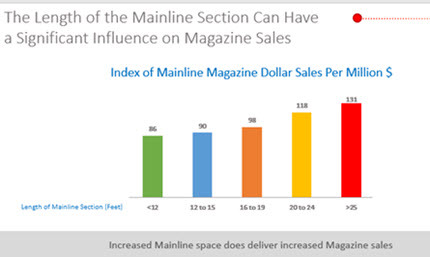 The average mainline shopper buys magazines in five different interest areas (at one time or another). 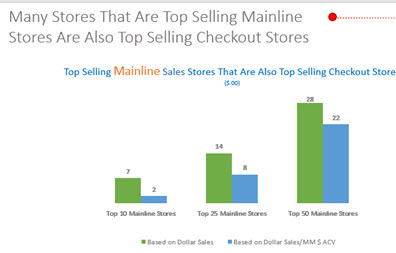 That’s why the top 100 titles generate 37% of mainline sales, while the top 500 titles generate 86% of mainline sales. It pays to review assortments to ensure that various magazine segments are allocated correctly, and that key magazines are full face. *The display has four or more tiers and 12 or more shelves. Stores with four tiers had “dramatically” higher sales than those with fewer tiers, and stores with a dozen or more shelves had 19% higher sales. Again, the numbers reflect the reality that offering variety in subject matter, and enough space to make magazines readily identifiable, are key in attracting a cross-section of shoppers. *The display has signage to help shoppers quickly find the type of magazine they’re looking for, and is well-lit to enable seeing cover lines and photos. 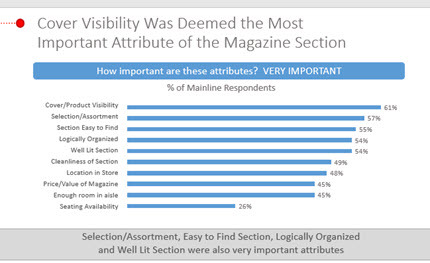 *Conversely, practices that mainline buyers say make it difficult for them to locate their desired magazine include locating the section after the checkout (cited by 40%), putting the section in a poor location in the store (39%), covers that are hard to see (33%), too-small section (33%), messy section (33%), poor organization (28%), poor lighting (22%), and not enough room to shop (17%). 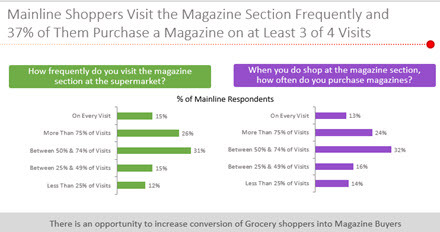 *Mainline magazine shoppers are very attractive grocery customers, demographically. Nearly 60% of respondents were between 25 and 54; half had household incomes between $75,000 and $150,000; and more than 60% had a bachelor’s or higher degree. *40% of mainline shoppers visit this section of the store on more than 75% of their store visits. *More than a third of those shopping the mainline purchase a magazine at least three out of every four trips. *The most popular types of magazines purchased are entertainment, food/wine, home/garden, sports, and health/fitness. *Most planned purchases are of magazines that a shopper purchases frequently. 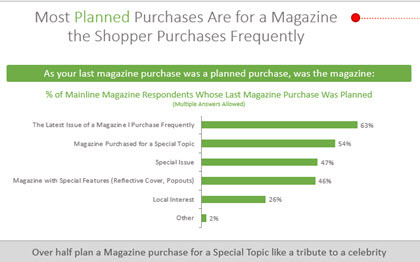 More than half of buyers said they purchase due to a special topic, like a celebrity tribute issue. 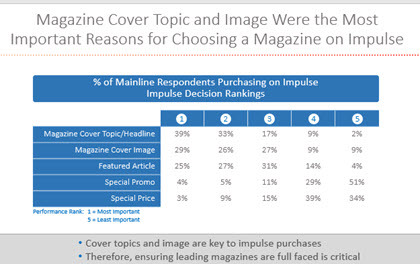 Dusek also noted that 35% of supermarket shoppers who indicated that they had not purchased magazines at supermarket mainlines said that they had purchased magazines in mass merchandiser stores. “That means that supermarkets have an opportunity to convert their shoppers into mainline magazine buyers, using merchandising best practices,” he said. 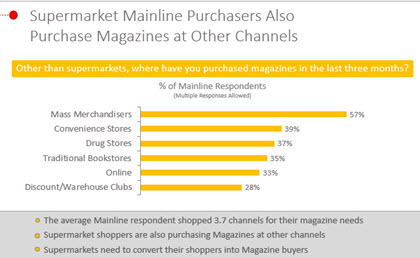 Further, those who do buy magazines at supermarket mainlines indicated that they visit 3.7 retail channels to fulfill all of their magazine needs — another opportunity for supermarkets to increase their share of these shoppers’ dollars. Finally, Dusek pointed out that many top-selling mainline supermarkets are also top sellers of magazines at checkouts.